When Sister Veronica Susan was speaking to area youth about vocations several years ago, she found herself frustrated. Students sitting in a high-school auditorium couldn’t fully grasp the joy that she and her congregation, the Little Sisters of the Poor, experienced in their work with the impoverished elderly. They couldn’t see the thankful smiles of the men and women who receive the nuns’ round-the-clock care at Holy Family Home, a senior residence in Southwest Philadelphia where some 100 older adults and 11 sisters live together in community. 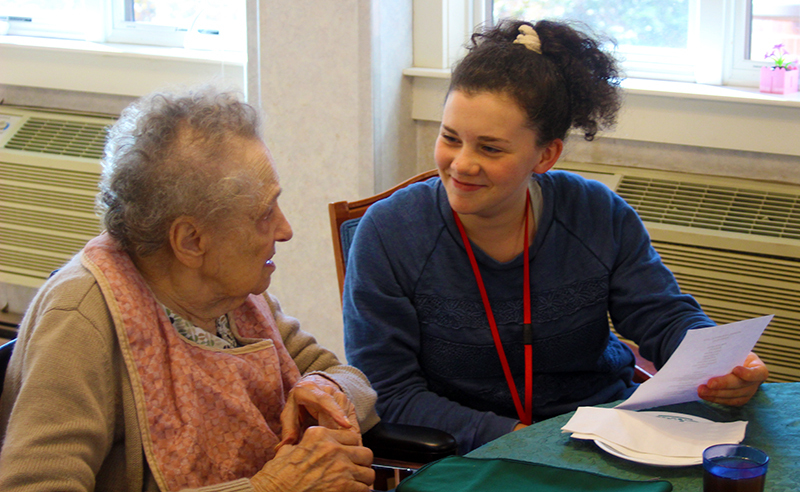 And the students couldn’t hold the aging hands that reached out in greeting, or hear the residents reflect on what life had been like when they were young. So rather than simply tell youth about a life of religious service, Sister Veronica decided to show them instead. The sisters placed a newspaper advertisement inviting interested teen girls to volunteer at the home. In nearby Springfield, Delaware County, Anita Galligan — a member of St. Francis of Assisi Parish — saw the ad, and thought it would be a perfect service opportunity for her homeschooled daughters. She alerted a few other homeschooling parents, and in 2006, the Hospitality Club of Holy Family Home was formed. Now in its 12th year, the club meets one Saturday morning each month at Holy Family to spend time with the residents. Its members — who range in age from 12 to 18 — serve the seniors breakfast and lunch, join them in prayer, assist them with arts and crafts projects, and even entertain them with original Christmas plays. And although the girls are there to help out, they end up receiving far more than they give. The teens also enjoy spending time with the sisters, who provide them with meals, mentorship and the gift of their presence. “They serve us while we serve them,” said Galligan, who has now handed the reins of the club over to moderators Renee McCullough and Carol Cardie — both of whom are parents of current members. Such generosity is central to the mission of the Little Sisters, who take a vow of hospitality in addition to vows of poverty, chastity and obedience. “We spend ourselves without reserve, in caring for those whom we receive as Jesus Christ himself,” said Sister Veronica, paraphrasing the words of the order’s founder, St. Jeanne Jugan. Born in revolutionary France, Jugan had worked as a servant and a nurse before establishing a community that focused on caring for elderly poor. She died in 1879 and was canonized in 2009. Jugan’s characteristic humility continues to shape the congregation, extending even to its volunteers. Both the founders and members of the hospitality club are quick to point out that that no one person spearheaded the ministry, which has been “very much a collaborative effort,” said Galligan. Families from surrounding counties — and from as far away as Reading and Delaware — carpool to enable teens to participate in the club. Parents arrange childcare for siblings too young to volunteer at Holy Family. As the girls have graduated high school and moved on to college, some of those younger siblings have assumed their places in the club. Now a junior in high school, Mary Cardie was drawn to the volunteer opportunity after her sisters’ example. “I would go during Christmas time to watch the play they put on at the home,” said Cardie, a member of St. Francis of Assisi Parish in Springfield. Many of the club’s alumnae, who often return to the home on holidays, are now in helping professions such as nursing and social services. A few of the current members are considering vocations to religious life. “It’s definitely on my mind,” said Bridget Haselbarth, a seventh grader in homeschool and a member of Our Lady of Lourdes Parish in Philadelphia. 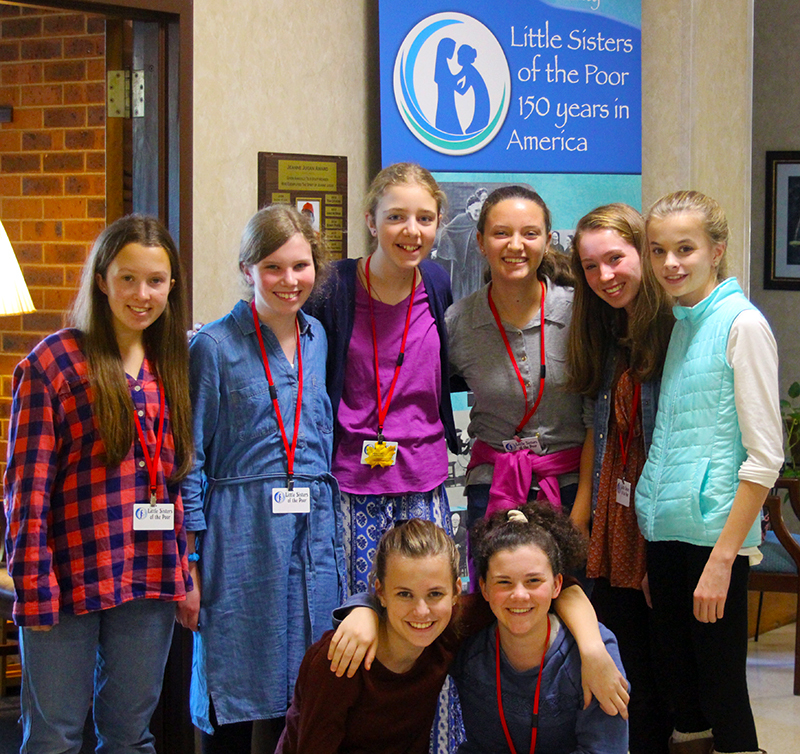 As with St. Jeanne Jugan, who began her mission by taking in an elderly blind woman, the club exemplifies how small acts of kindness can evolve into a successful ministry. Teens who wish to start a similar outreach should start with those closest to them, said member Mimi McCullough.